Besides manually updating six separate instances WordPress (to version 2.6) in the NMC fleet of sites, I also finally paid some over due attention to the version of WordPressMultiUser I have had up since November 2007. This tool some rustling to get it to the right version and also what had not been done in a while- making the front door. I am hardly a WPmu guru, certainly no bavatuesday… maybe a bavalatethursdaymorning. Most places running WPmu are doing it to provide a blog hosting service, like edublogs or the crazy stuff the Rev does at Mary Washington. My need was to have a series of separate sites hosted in WordPress w/o having to have an even bigger fleet of separate installs (Heck, maybe one day I can rope them all in under the WPmu hood). No these are all a series of online publications we have done at NMC in the lasy 8 months, all using the slick CommentPress template. Developed by the Institute for the Future of the Book, CommentPress provides a way to post a series of publication chapters as “blog” posts, but the special feature is that comments can be attached to individual chapters. So we have things like the 2008 Horizon Report in this format as well as the text of a keynote given by Howard Rheingold on Co-Evolution of Technology, Media and Collective Action. Until just a few minutes ago, these were separate little sites, but now I have at least a crude launch page for the entire WPmu site at http://wp.nmc.org. I’m just back from a 3 day visit to St Paul for the Midwest Library Technology Conference hosted at Macalester College. This was the first time for this conference, and with attendance well over 250 and from the level of activity I observed, planner Ron Joslin and colleagues should be very pleased. I liked very much how they tried a variety of session formats other than 50 minute lectures (like in the Games in Libraries session we actually got to play some of the games; I might be hooked on Wii bowling after a few rounds). I should add another noticeable feature of note at the conference was the overt effort to be green sensitive with the amount of paper generated- the program was a singl trifold, double side printed with agenda on one side and map on the other. They asked us to turn in name badges every day to re-use the paper and holders. There were no ugly conference bags stuffed with glossy ads. Its small but commendable. My NMC colleague Rachel Smith and I were invited to do a keynote on the NMC Horizon Report; as heard this group was interested in exploring/examining emerging technologies. For our session, we took the risk and prepared a presentation in Web 2,0 beta software, the amazing Vuvox Collage (yes its still in beta and sorry no, I dont have beta invites to share.. I just asked them for an account). I was deeply inspired by the Balancing Act presentation shared a few weeks ago by Barbara Ganley, and rolled Collage into my 50 Ways tools with one about Dominoe. 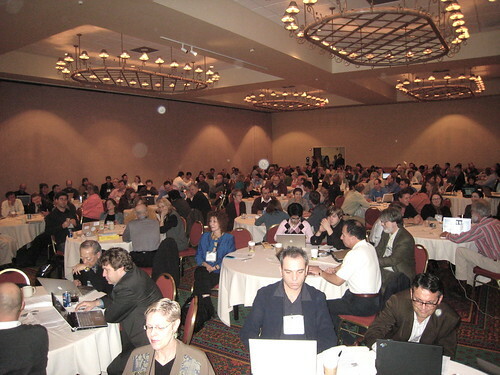 This past tuesday was the official release of the NMC 2008 Horizon Report like we do every year at the EDUCAUSE ELI Conference (hey Chronicle, that is TUESDAY, JANUARY 29 2008!). The full report is available, for free, as a 256k Creative Commons sprinkled PDF. Please download and share pervasively. As somewhat of an experiment, it was actually posted more than a week earlier on the Horizon Wiki, where in fact, all of the Horizon Project’s work has been there, in the open, from the start of this year’s process in August 2007. Not one blogger picked up on the early listing of the shortlist, the 12 finalists. But a number of y’all did find the PDF last week and started biting into it… and we like that. We are not obsessed of keeping a shroud of secrecy on the report before we let it loose at ELI. We had quite a crowd! You can watch the whole thing as video as the ELI magic elves recorded and live streamed the whole session. My usual contribution to the ELI event is helping conjure a wacky way of presenting the new 6 Horizons. This year I came up with an idea to make a nod to last year’s Blues Brother theme, but twist it slightly.